Sgt. 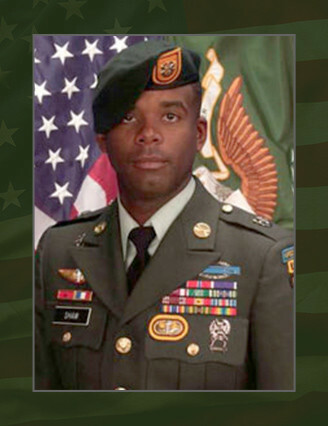 1st Class Christopher D. Shaw, 37, of Natchez, Miss. died after his vehicle struck an improvised explosive device Sept. 29, 2009, on Jolo Island, Philippines. Shaw was assigned to 3rd Battalion, 1st Special Forces Group (Airborne), Joint Base Lewis-McChord, Wash. and was deployed in support of Operation Enduring Freedom-Philippines. This was his second deployment in support of OEF-P.
Shaw enlisted in the U.S. Army reserve Nov. 22, 1994, while attending Texas Southern University in Houston on a track and field scholarship. In May 1995, he decided to join the active-duty Army as a forward observer. Upon completion of basic training, advanced individual training, and the U.S. Army Airborne School, Shaw was assigned as a fire support specialist to 2nd Bn., 75th Ranger Regiment at Joint Base Lewis-McChord, Wash. In 1997, Shaw volunteered for the Special Forces Assessment and Selection course and completed the Special Forces Qualification Course in March 1999. Shaw was then assigned to 1st SFG (A) at Joint Base Lewis-McChord, Wash. He later served as an instructor at the Special Forces Qualification Course at Camp Mackall, N.C. and subsequently returned to 1st SFG (A) at Joint Base Lewis-McChord, Wash.
Shaw’s military education includes the U.S. Army Airborne School, U.S. Army Ranger Course, U.S. Army Jumpmaster Course, Basic Instructor Training Course, Advanced Non-commissioned Officer Course, Basic Noncommissioned Officer Course, Warrior Leader Course, Special Operations Target Interdiction Course, Combat Lifesaver Course, Survival, Evasion, Resistance and Escape Course and the Special Forces Qualification Course. Shaw also holds a Bachelor of Science degree in history from Thomas Edison State College in Trenton, N.J. Shaw’s awards and decorations include the Meritorious Service Medal, the Army Commendation Medal, Army Achievement Medal, Army Good Conduct Medals National Defense Service Medal, the Global War on Terrorism Expeditionary Medal, the Global War on Terrorism Service Medal, the Non-commissioned Officer Professional Development Ribbon, the Meritorious Unit Citation and the Philippine Presidential Unit citation. Shaw earned the Special Forces tab, Ranger tab and the Parachutist Badge. He was posthumously awarded the Bronze Star Medal, the Purple Heart, the Meritorious Service Medal and the Combat Infantryman Badge. Shaw is survived by his wife Attina and their children Darian Shaw, Erielle Smith, Jalyn Smith, Dante Shaw and Cydney Shaw of Joint Base Lewis-McChord, Wash. He is also survived by his mother and step-father Camille and Willie Felton of Chicago, Ill.; his father Walter Owens of Port Wentworth, Ga.; two brothers, Orlando Shaw of Chicago, Ill. and Maurey Owens of Jackson, Miss. ; and two sisters Kenya Shaw of Chicago, Ill. and Gwen Owens of Atlanta, Ga.